The weblog editor for people with style. Is there a better alternative to myBlogEdit? Is myBlogEdit really the best app in Internet Utilities category? Will myBlogEdit work good on macOS 10.13.4? 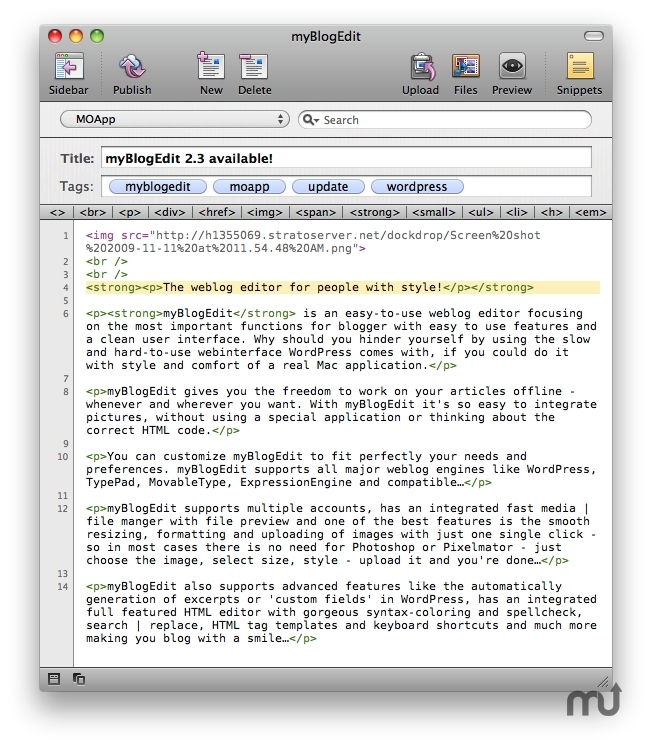 myBlogEdit is an easy-to-use weblog editor focusing on the most important functions for blogger with easy to use features and a clean user interface. Why should you hinder yourself by using the slow and hard-to-use webinterface WordPress comes with, if you could do it with style and comfort of a real Mac application. myBlogEdit gives you the freedom to work on your articles offline - whenever and wherever you want. With myBlogEdit it's so easy to integrate pictures, without using a special application or thinking about the correct HTML code.